When it comes to kids and eye safety, there’s always something. 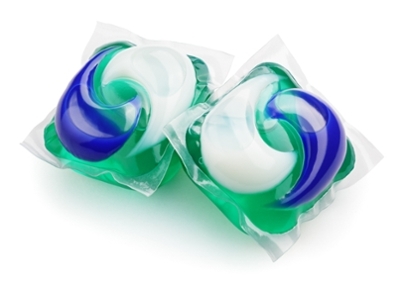 Now, a recent study published in JAMA Ophthalmology has revealed that since 2012, more than 1,200 three- and four-year-olds experienced chemical burns to the eye from laundry detergent packets—a 30-fold increase between then and 2015. The danger happens when kids pick up the tempting, brightly colored pods and pop them. The chemicals inside can cause serious burns to the cornea (the clear covering of the front of the eye), eyelids, and skin around the eyes. Chemical burns can result in a lifetime of decreased vision or even total blindness. If children swallow the packets, the poisoning can be fatal. The hazard is so prevalent that the American Academy of Ophthalmology and the American Medical Association have teamed up to help. They are asking the Consumer Product safety Commission and the American Association of Poison Control centers to review current voluntary manufacturer standards for laundry packets. Chemicals in liquid cleaning solvents can be toxic to any mucous membranes, including the surface of the eye. Think bleach, ammonia, oven cleaner, toilet bowl cleaners, for instance. Use them only in areas with good ventilation, and if you think there’s going to be splashing or spraying, be prepared with protective eyewear. Frying with grease or oil? Just one splatter in the eye can cause a significant burn. Protective goggles can protect your eyes from burns and from the volatile oils in ingredients such as onions and hot peppers that can irritate sensitive eyes. High-velocity projectiles from debris. Make it a habit to wear eye protection and to keep the kids at a safe distance. Soft pellets from “Nerf Guns” might seem harmless, but when shot a high velocity, they can cause significant blunt trauma injury to the eyes. Again, protective eyewear is a great idea. You’ve seen the videos online. Things can go very wrong with a curling iron—including poking or burning an eye. Of course you wouldn’t wear protective eyewear while curling your hair, but don’t rush it and, though you’d think people would know better—don’t multi-task while wielding a burning hot metal rod. If you get chemicals in your eye, rinse and flush to neutralize the substance as much as possible, and as with any other injury, get into see an ophthalmologist as soon as possible.